Returning to a by-gone era, we boarded the train in Napa for a luxury excursion through Californias world-famous wine country. The vintage cars were turn-of-the-century Pullman carriages adorned with rich mahogany, etched glass, and cozy love seats. 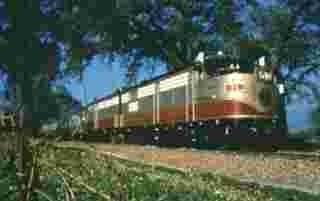 We were pampering ourselves on the Napa Valley Wine Train, dining on fresh salmon and a fine Sauvignon Blanc. What a great way to see Napas beautiful countryside! Our three hour excursion took us north on a 36-mile journey towards the picturesque town of St. Helena, before our return. This was our first evening of decadent dining in the gourmet valley of California. Here for four days to explore Napa Valleys treasures, we knew our nights would be filled with wonderful treats to tempt anyones palate. The goal was to savor all these delights, but to return home without gaining an ounce. How to accomplish both? We took our mettle to the pedal, and decided to bike the back roads, enjoy the scenery, and visit some of the wineries and sights along the way. George Yount, the first American settler in Napa Valley, planted the first grapevines in the 1830s. High-end European grapes were introduced in the 1860s, with Napas excellent climate and soil conditions making grape growing a thriving business. The wealth from the San Francisco Gold Rush created a huge demand for wine. By the 1890s, there were over 600 vineyards throughout the valley, including Charles Krug Winery, Beringer, and Inglenook. Prohibition, from 1919-1933, closed almost every winery in Napa. 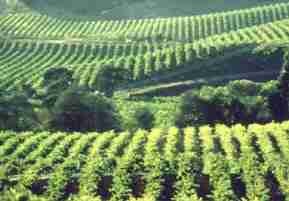 Vineyards were ripped out and were replaced by walnut and prune orchards. Those that were permitted to operate provided sacramental wine for churches or wine for medicinal purposes. Beringer Winery The repeal of Prohibition gave new life to the valley. Today, over 200 wineries call Napa Valley home and Napa has recaptured the wine fame it held prior to Prohibition. Varietals range from Bordeauxs, like Cabernet Sauvignon and Sauvignon Blanc, to the Burgundies, like Pinot Noir and Chardonnay. Merlots, Rieslings, Zinfandels and sparkling wines can be enjoyed here as well. Highway 29, the main thoroughfare through the valley, passes world-class wineries in charming towns such as Yountville, Oakville, and Calistoga. The Silverado Trail that runs along the east side of the valley from Napa to Calistoga was our first days route. The Trail gets its name from its history of carrying quicksilver (mercury) from the mines in the county during the 1800s. Just north of Napa off Trancas road, the trail follows the valley north for about 36 miles before ending near Calistoga. Meandering past vineyards that march up the hillsides, we peddled by scenes from the past: a quaint stone bridge, an old schoolhouse, and historic Victorian homes. Although the road was fairly flat, we worked up quite an appetite for tasting. At Pine Ridge Vineyards, barrel tasting in their underground caves was a new experience, and we found their Cabernet Sauvignon to be rich and full-bodied. Down the road at Shafer Vineyards, we toasted a silky Merlot to accompany our picnic lunch. Time to call it a day, and peddle back for a quick game of tennis before another night of indulgent dining. 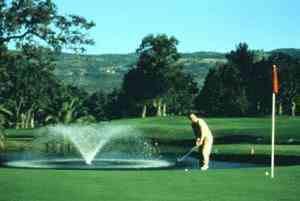 We had checked into the elegant Silverado Country Club Resort for our Napa stay. Just one of the seven golf courses in the valley, its tree-lined lined drive ends at a graceful white-pillared mansion built in the late 1800s. This 1200-acre resort is complete with two 18-hole golf courses, 23 tennis courts, pools and jogging trails. A comfy bed and intimate surroundings made our cottage near the mansion feel like home. Dinner in Silverados main dining room was elegant and a delicious ending to our day. We awoke at dawn to beautiful clear skies and colorful hot air balloons floating above the vineyards. Experienced balloon companies offer personalized adventures -- float over the vineyards and mountains of the valley, then top the trip off with a delicious breakfast or champagne brunch. Balloons hold from four to nine passengers, and rides cost $180- $195 per person. Outdoor activities are abundant here. Soar high above the valley in a glider, with only the whisper of the wind in your ears. Explore the Napa River and enjoy gourmet cuisine on the Napa Riverboat. Visit Lake Berryessa, located northeast of Napa on State Route 121. Over 20 miles long and three miles wide, Berryessa offers swimming, fishing, boating, water skiing and shoreside camping. There are three towns we found to be charming and fun to explore. Yountville, with just 3,000 residents, feels like a village. A 120-year old winery has been converted to a wonderful shopping experience. The Vintage 1870 is filled with specialty shops, garden cafes, and galleries. We dined at a fabulous restaurant in Yountville; Frankie, Johnnie and Luigie Too, feasting heartily on Italian pasta. St. Helena is located in the north valley. Galleries, boutiques, and antique shops line its traditional Main Street that runs through the heart of town. One of the best meals of our trip was enjoyed at the Meadowood Resort, near St. Helena. A fresh salmon with an extraordinary avocado sauce has never been duplicated in our gastronomic adventures. If you want to get mellow, Calistoga, is the place to do it. Get a massage, take a mud-bath, and soak in their famous bubbling mineral water at one of the local spas. Two natural wonders are nearby. Old Faithful Geyser of California, is just two miles outside town on Tubbs Road. The geyser erupts every 40 minutes or so. The Petrified Forest is located about six miles away. Six million years ago, giant redwoods turned to stone after being uprooted and covered by volcanic eruptions. Harvest time, usually beginning in late August, is a perfect time to enjoy the Napa Valley. Depending upon the grape, wine, and weather conditions, harvest can last through the first week of October. Warm weather shortens the season, and a warm summer could see the harvest complete by the second or third week of September. Like a good wine, the valley should be savored at a leisurely pace. Walks through Napa Valleys treed lanes, golden sunsets, wine tasting, and biking excursions make this a relaxing getaway. Click here for details to plan your own trip to Napa Valley, the heart of Californias wine country.